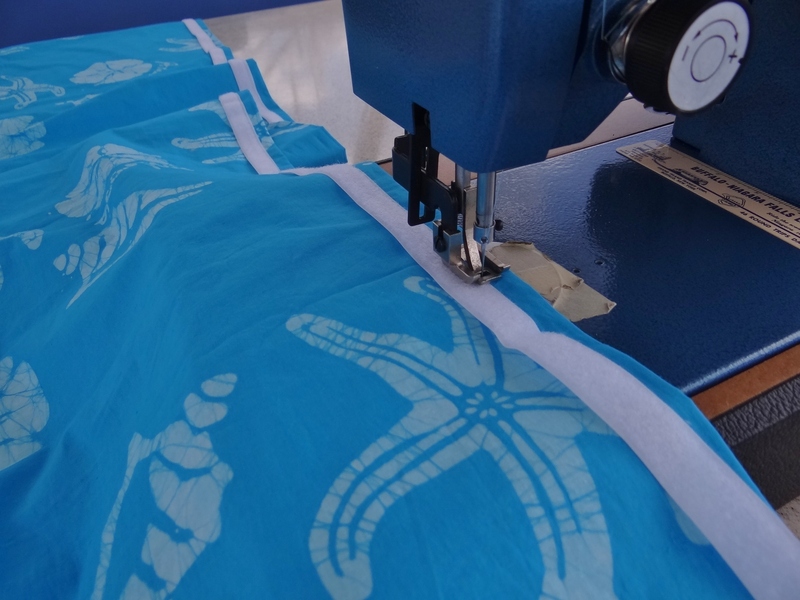 I enjoy a love / hate relationship with my Sailrite LSZ Ultrafeed sewing machine. I love that we’ve (my trusty helper and I) been able to undertake a whole bunch of sewing projects, on our time schedule and not have to pull out kitty’s ears to do it. (cruising kitty- get it?). I hate that it’s like a third anchor and we can’t store it near the bow. We need to move weight toward the stern because the boat tends to be bow heavy. Dinghy chap lower hem cover strip- heck I don’t know what to call it, but let’s be clear on this; it’d better do its job because we are done messing around with these chaps (no, not our dock neighbors!). The solution to end all solutions was this: sew Velcro to the outside of the bottom hem of the chaps (or, as our next dock over neighbor says, “dinghy condoms”) from the stern to just before the bow curves up. 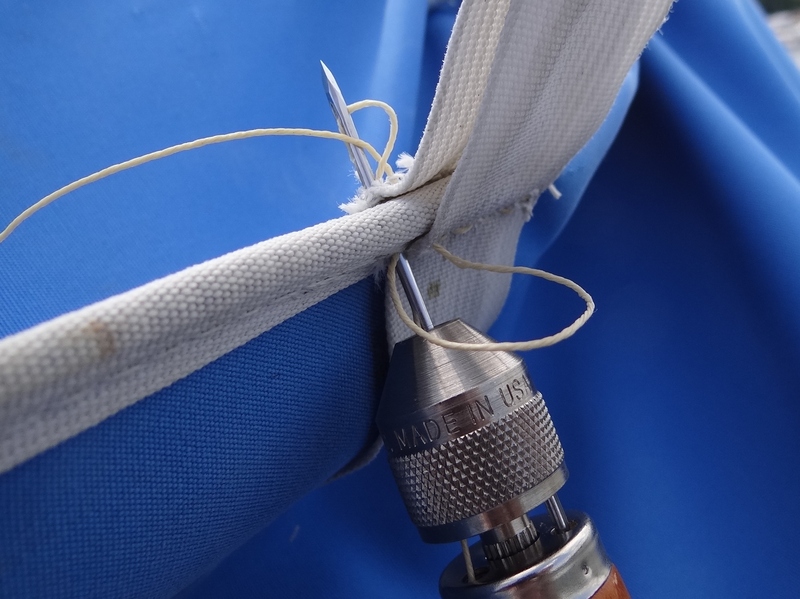 Glue a 3” wide strip of Hypalon to the dinghy with “hook” Velcro sewn at the stop edge; the bottom glued to the dinghy. And voila! A hermetically sealed, water impervious covering over the bottom hem; we can only hope that this will keep the water out. Initial tests are encouraging- no water mon, but we’ll claim victory after we’ve achieved dry runs in Elizabeth Harbour, George Town Bahamas. 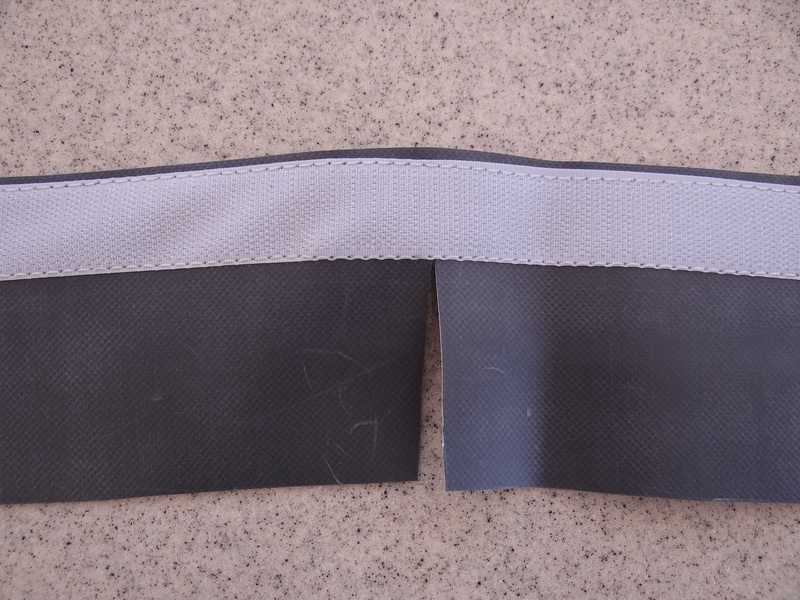 Hypalon strip with Velcro sewn. The exposed Hypalon gets glued to the dinghy. 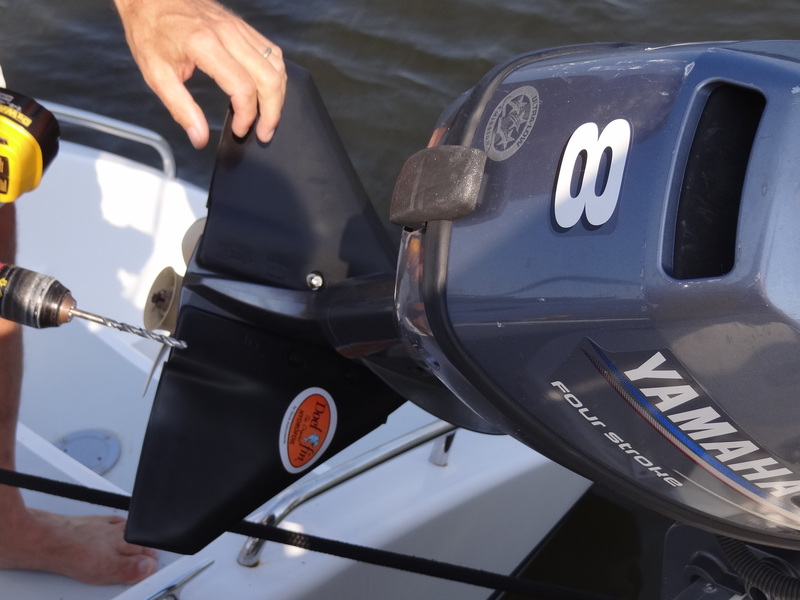 An addition to the prop that will help ensure success is our new Doel outboard fins. Seems 95% of the outboards we saw in the Bahamas had outboard fins and they do a fantastic job of getting Bunting up on plane in seconds. When we are up on plane the water is less likely to push into the chaps through the bottom. Our test run was amazing. “You mean we’ve been suffering all this time and all we had to do was to spend $40?” Our 8 HP engine needs allthe help it can get. Ok, so this isn’t a sewing project, but it deserves mention. Moving along to interior decorating-not that I don’t like sewing Velcro, but let’s face it, curtains and a headboard are far more satisfying. In George Town I bought Androsia fabric in two colors- made guess where? Andros Island- the largest Bahamian island that almost no one visits. 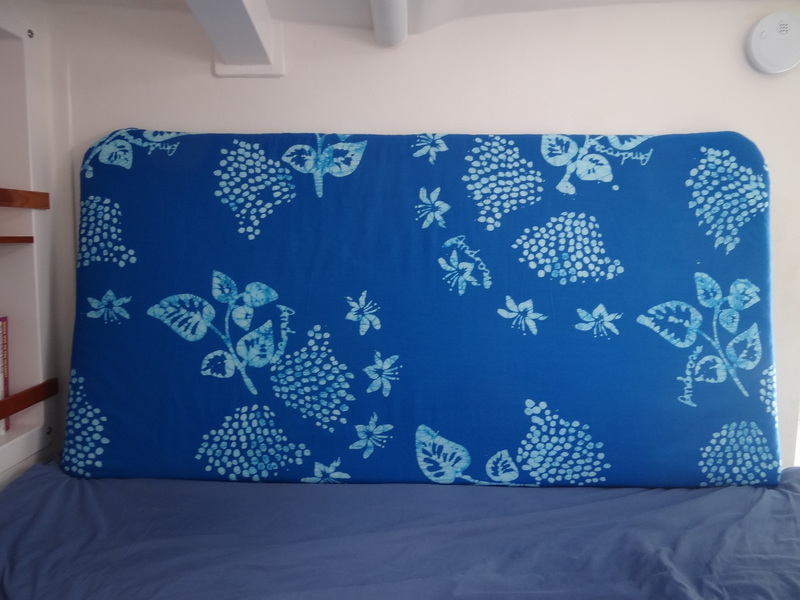 The darker (medium blue) fabric I used to make a headboard for our bunk. We constructed it from ¾” PVC, using 90 degree connectors at the two bottom corners and two 45s at each top corner. For added strength Russ put dowels inside the top and bottom PVC tubes. 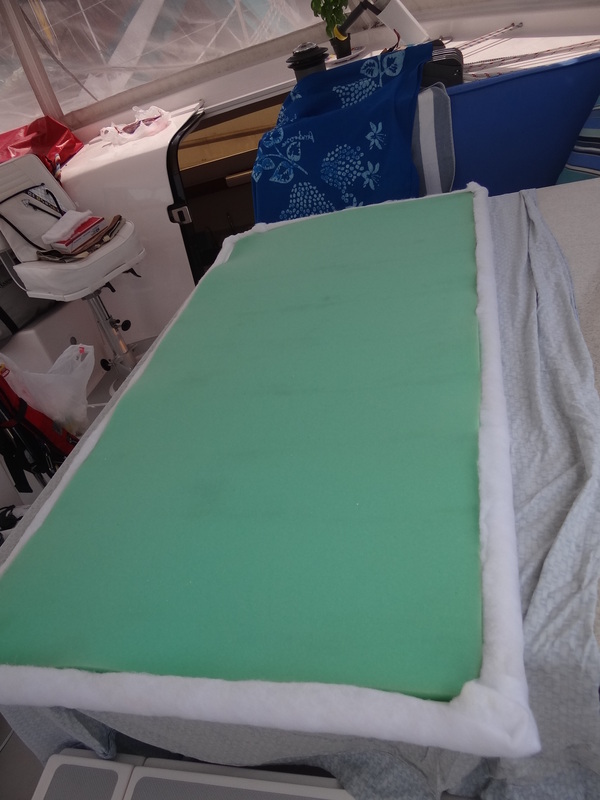 A 1” thick piece of 24”x48” foam rests inside the batting-wrapped PVC frame , then the fabric covers the batting on the forward-facing side. Extra-heavy duty Velcro attaches the headboard to the wall at the head of our bunk. This projects gets an “easy” rating and no sewing involved J. Added comfort and color, sound absorption – all wrapped up in on day. My kind of project! 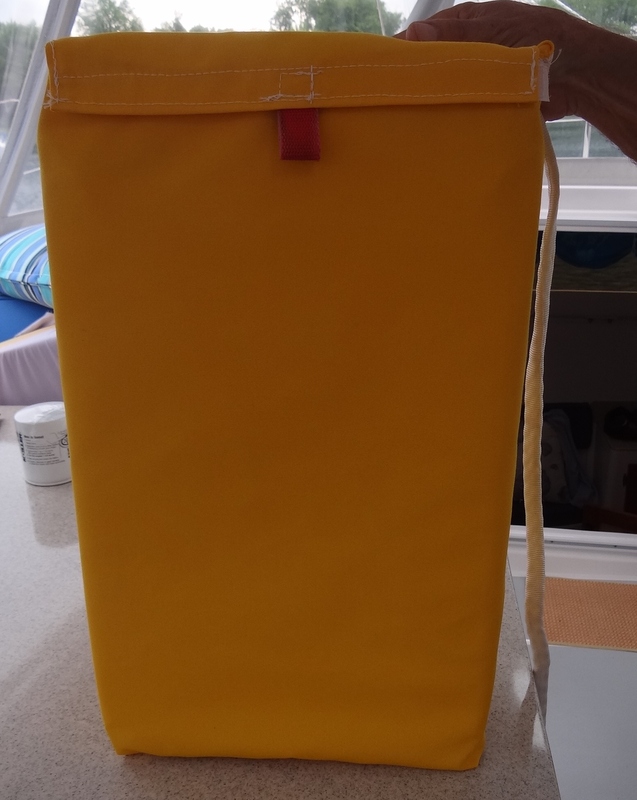 The curtain project required my Sailrite Ultrafeed LSZ machine- the boat anchor in a box, no weakling can lift it machine. Machine and carry case- what? Are they crazy? You can’t carry this thing; you can barely lift it on to the table! So you know who does that; no spur of the moment sewing for this faux-seamtress. The curtains are another easy sewing project; just a bunch of rectangles with Velcro sewn at the top. 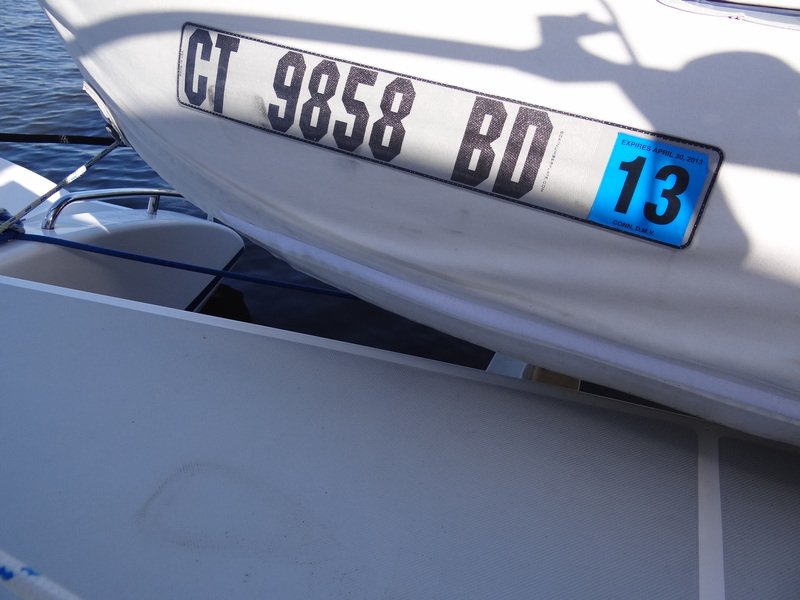 We didn’t want to make another hole in the boat or spend much money,so… we kept it simple. Last summer I made a curtain for the window next to the bunk on the port side so Benj could have privacy at night. We used self-adhesive (hook) Velcro on the wall (the glue didn’t work) and I sewed the loop part along the top of the curtain. I made the curtain longer than the window so it could be gathered a bit. When we leave CT I tie it up to let in more light. 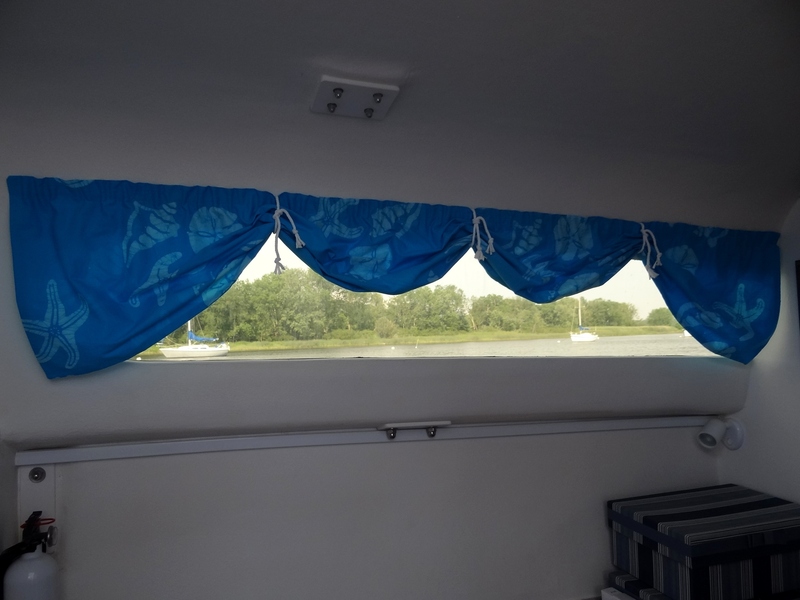 That curtain worked out well so I did the same on our side, for both windows and with unplanned extra I made shorties for the galley. With that, I thought for sure I was done. Alas, the Captain ever vigilant noticed our Lifesling bag was looking, well, extremely faded and I had to agree. 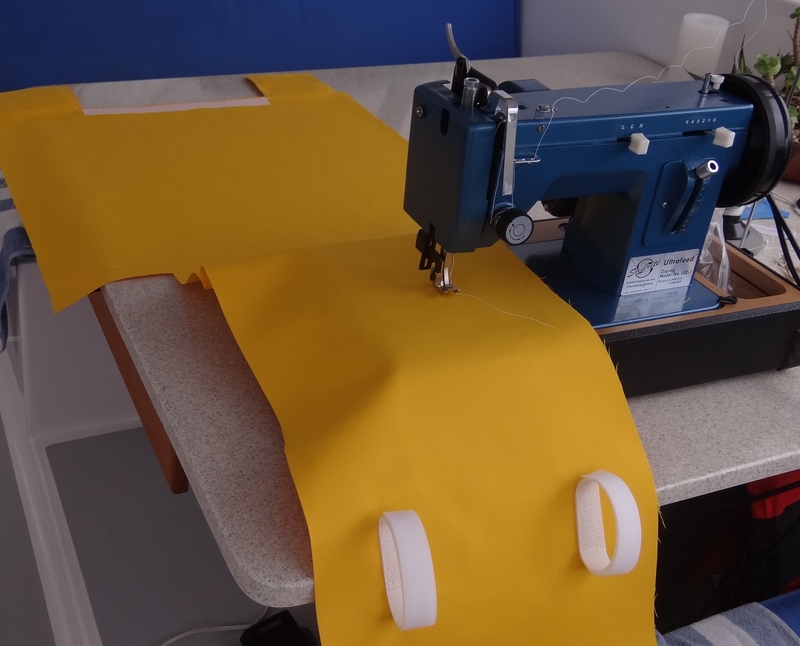 I ordered a yard of 45” wide Sunflower yellow Sunbrella marine grade fabric from my favorite supplier of all things sewing and I less than a day- voila! a new cover. I think I’m getting the hang of all this- what should I call it?- non-garment sewing. Since my first Singer machine at age 13, 95% of my sewing was clothes; piping was not in my vocabulary. The Lifesling bag was constructed using only pieces of material; I took it apart and used it for a pattern. We’ve accumulated a decent inventory of Velcro and happened to have exactly what was needed for the bag. I re-used the red webbing from the old bag: something old, something new, something sewed; it’s better for you! A new, purchased bag would have cost us $50; this was no more than $20. My prior order from Sailrite included a clever gadget called the Speedy Stitcher Sewing Awl. I watched the how-to video and now own a device that is “sew” the opposite of the Ultrafeed. Designed for repairs that you can’t do with a machine, it is simplicity itself. The needle is sharp as hell; I left “Lori was here” marks on both sides of the stackpack support straps. The stitcher comes with thick waxed thread and two needles: straight and curved. I bought fine waxed thread and a thinner needle to use for that and the V-92 polyester thread I use for my Sunbrella sewing. This entry was posted in Uncategorized and tagged projects. Bookmark the permalink.